For which we are fit through His worth and perfection. While God’s heart rejoiced in His charm and His savour. And all is transformed at that great liberation. What it had cost the Giver. While I learn what it means to Him. Since my Best Gift is Jesus. Within whose life a selfish mind controls? Into His presence, righteous in His Son. What He has in Christ. On Him God’s storm of anger broke. Such His desire to save! When I was far, to bring me nigh. And all of one with Him who died. Christ writes in our hearts. The Lord who heals you". 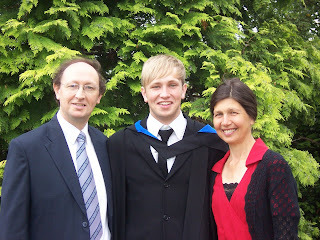 Julian on his graduation day, with Rosie and me. Acknowledging that He is Lord of all. Before Christ Jesus every one shall fall. A disturber of their swamp. Punishment fit for a slave. To the doorpost's fierce piercing. Pillars before the temple, Jachin and Boaz. Of the love of Jesus: “He will establish”. Founded in this knowledge: “In Him is strength”. Clung to that Lord’s conspicuous pillars here.